Every year about this time, my house turns into a replica of Santa’s workshop. The kitchen is the hub of my merry making operation. Often we have to dig a hole in the counter to find a place to make supper…not something I’m proud of, but my kitchen really has the best natural light for crafting. 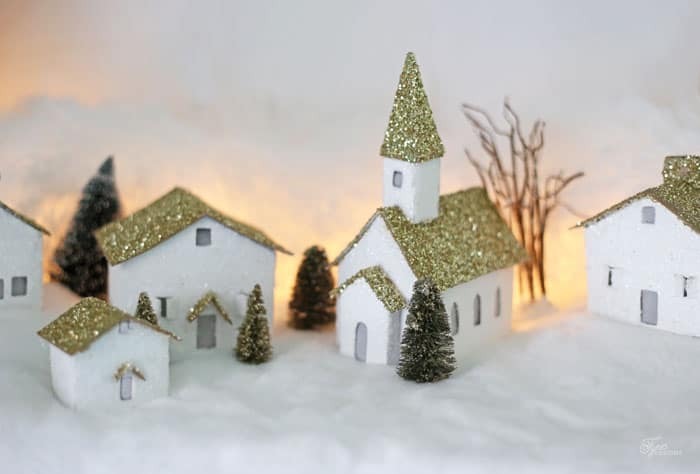 This year to kick off my holiday making, my kids and I are putting together some little village houses for Christmas made from cereal boxes, plus I’m sharing a free template so you can get making them too! These little village houses are so sweet, and really let everyone use their imagination. 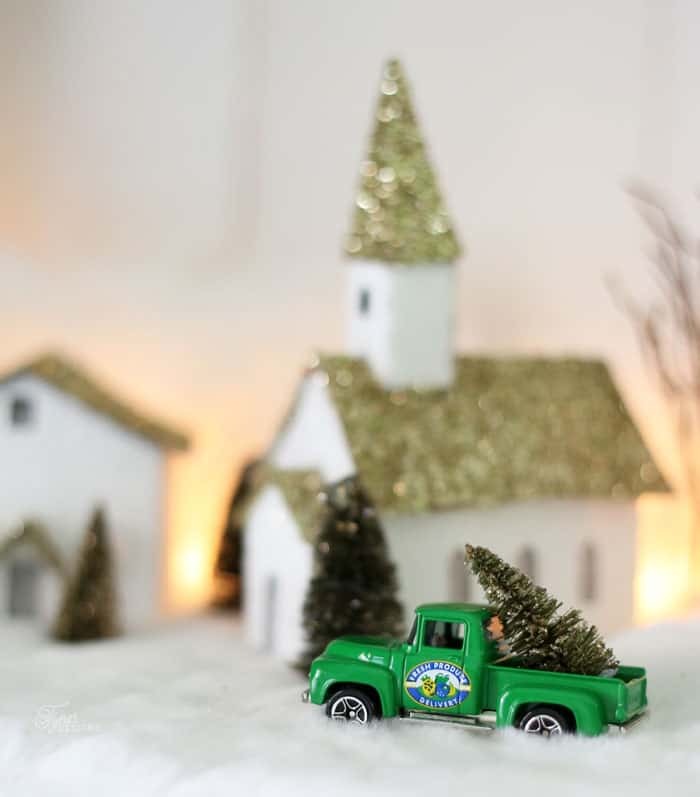 They are perfect for decorating the tree, mantle, or creating an entire snowy town. 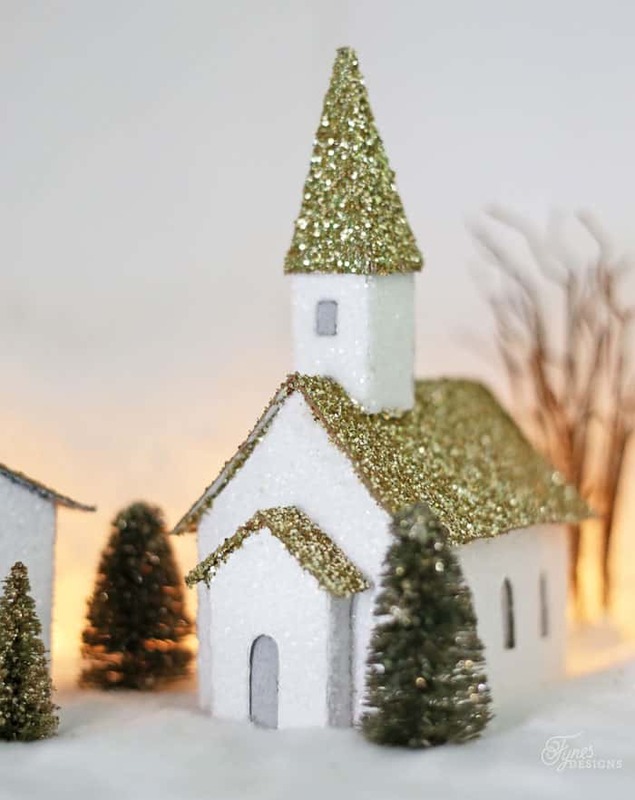 My children love making crafts just as much as I do, and you know when it comes to Christmas crafts, glitter and sparkle paint are typically involved. I gave up trying to contain the beast. 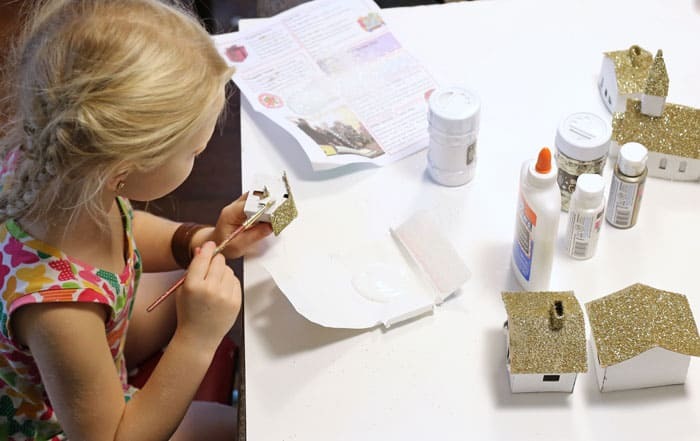 Letting go of ‘tidy craft time’ and embracing the memory making moments means being a little carefree when it comes to kids crafts. It has made crafting time together a lot less stressful. 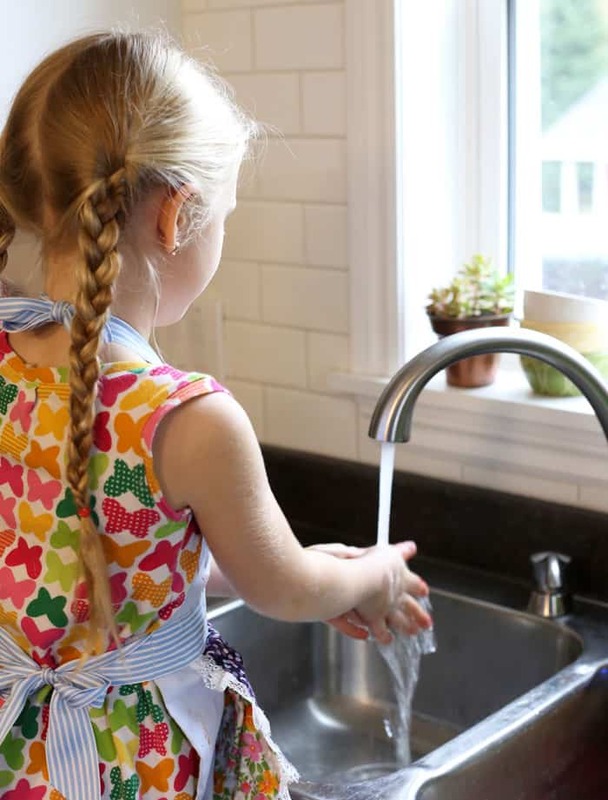 Now I just depend on our Delta Touch2O® faucet to come to the kid (and mommy) tidy up rescue. 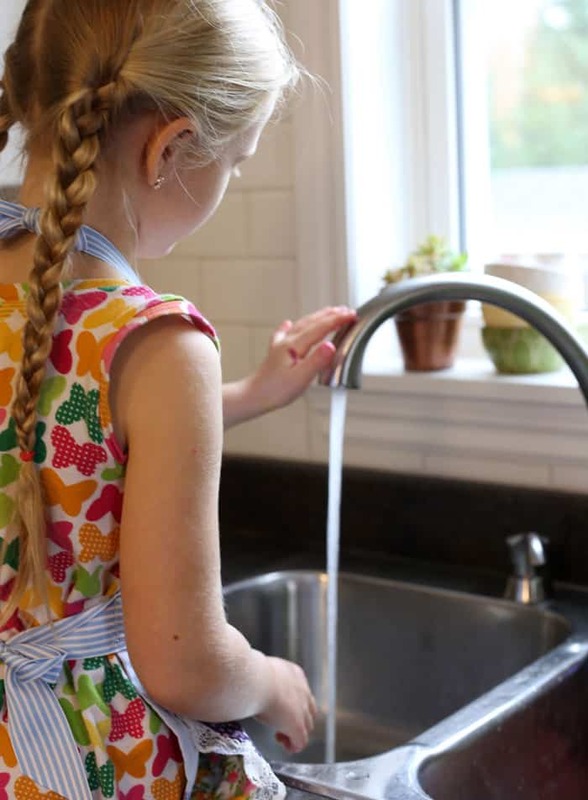 The kids can climb up the stool tap anywhere on the spout or handle to start and stop the water, this one little luxury in our kitchen has made Christmas crafts easier when your hands are messy or full. Next up on my wish list is to add them in the bathroom too! This time of year I am at my busiest, its so nice to be able to involve my kiddos and incorporate them into my projects; I have never seen my children unhappy when they are up to their elbows with paint, and shimmering in the light with glittered cheeks. Its comforting to know if I leave the room for a minute, they can help themselves with our ‘magic’ Delta faucet, it has really changed craft time. After all big holiday messes aren’t a bad thing, but simply evidence of our precious moments spent together. We’re proud to be mess makers and loving every second of it… now to just get Mr. Fynes on board! How are you and your family getting messy this holiday crafting season? Share your #HappiMess moments with Delta on Facebook and Twitter. I love the houses you made. Thanks for the template I want to try and make a few. 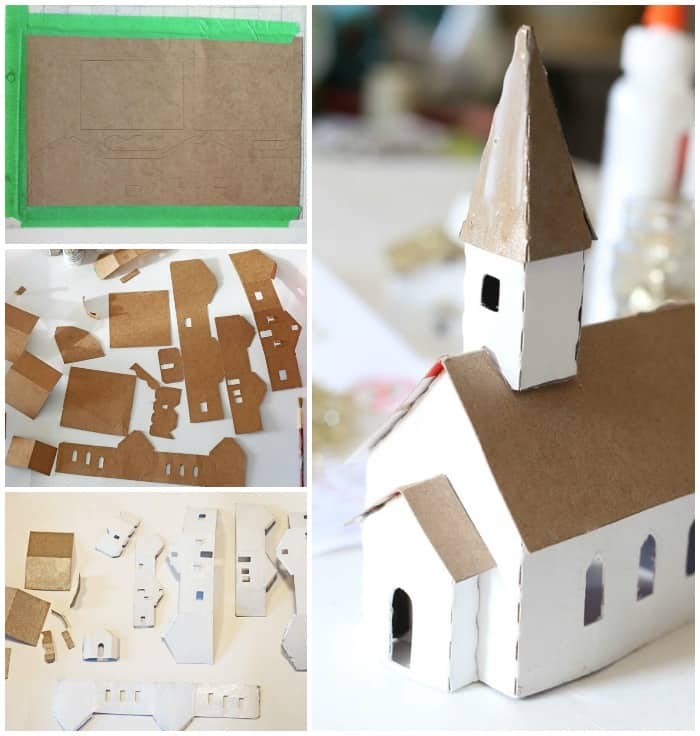 Could you use cardstock for the houses? I enjoy your blog so much. I think cardstock may be too flimsy if you try to glitter it. Good luck and thanks for visiting! Oh my gosh! Those little houses are absolutely adorable! 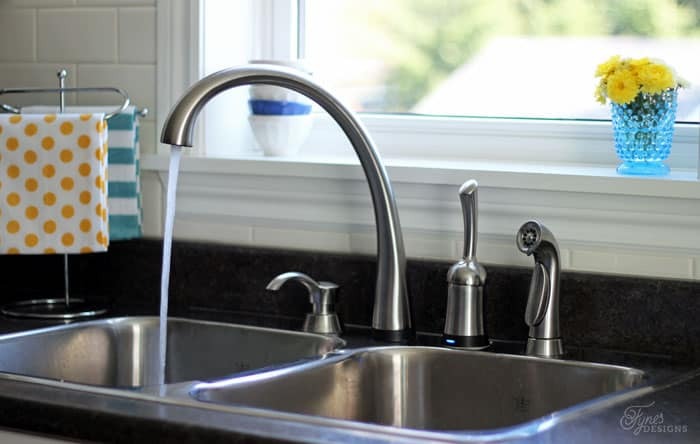 And how cool is that faucet?! Thanks Kristi! We had a lot of fun making a mess! I love those little putz houses and someday will make some. The picture of your little girl caught my attention. I had blond pigtails just like that (and ear rings) So darling. I looked quite similar (a little more pudgy) as a little girl too! These are just lovely and I can’t wait to try this project~Thanks for sharing on Throwback Thursday! What a lovely Christmas craft project. Congrats, you’re featured this week at the #ThisIsHowWeRoll Link Party on Organized 31.